The Premier League have confirmed that Tottenham Hotspur wish to retain the services of six players of Nigerian descent ahead of the start of pre-season training. 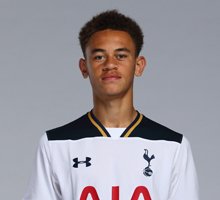 The Nigerian players retained include the outstanding midfielder Dele Alli, England youth internationals Timothy Eyoma, Keanan Bennetts, Luke Amos and Josh Onomah, and Moroyin Omolabi. Of the aforementioned youngsters, Alli and Onomah have played for the first team of the The Lilywhites. Last season, Eyoma, Bennetts and Omolabi played mainly for the U18s team. Central midfielder Luke Amos spent the second half of last season on loan at Southend United, and appeared three times in League One for the Seasiders.